Egg-white Frittata Has Won THE FRUGAL GOURMET Contest! You are here:Home » Recipes » Egg-white Frittata Has Won THE FRUGAL GOURMET Contest! 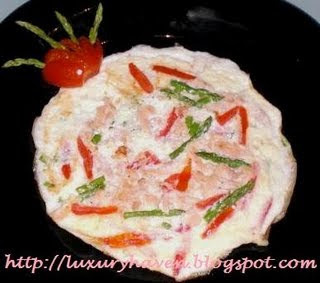 Yes, it's another wonderful win - My Egg-white Frittata Recipe submitted to MediaCorp has won "The Frugal Gourmet" Contest 2009! It's a contest to recreate the dish after watching Prime Time Morning. Do try out this easy-to-do healthy breakfast. And what did I win? 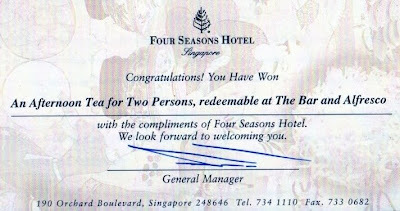 An Afternoon Tea for 2 @ the prestigious Four Seasons Singapore. Gosh! I love High-teas especially the English ones. What do I like about High-teas? Freshly baked scones with clotted cream in comfy atmosphere, the variety of teas & of course, lazing in deep sofas. Mmm........ really looking forward to another indulgence. Thks deli simplicity, for your support!